John Ott's great artwork resulted in this car built from an MDC passenger car kit. Note the wood blinds in the windows. One of the many weaknesses I have is for circus advance cars. These are the cars which moved ahead of the circus to plaster the advertising posters over every barn and building side they could find. The cars were usually decorated very gaily since they were a rolling billboard. 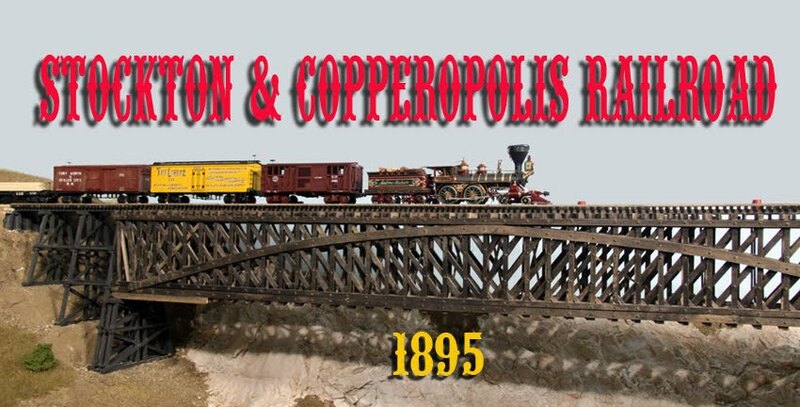 Way back in the March 1995 issue, Railroad Model Craftsman published an article of mine on how I built cars 1 and 2 for the Buffalo Bill Wild West Show. The cars themselves were scratchbuilt but used commercial dry transfers. I was able to fiddle with the transfers a bit to get a couple of different colors and I still use them on the railroad. Recently I discovered that there was a Car No. 3. John Ott (www.ottgallery.com) had turned up a prototype photo of the car and had made some artwork for the lettering. His car looked fantastic so I asked if I could use the artwork to make a similar car. He generously agreed. The result is my Car No. 3. It is basically a Model Die Casting coach. Very little was done with it other than to replace the truss rods with nylon fishing line and use body-mounted couplers. Intermountain wheels also replaced the kit's plastic ones. 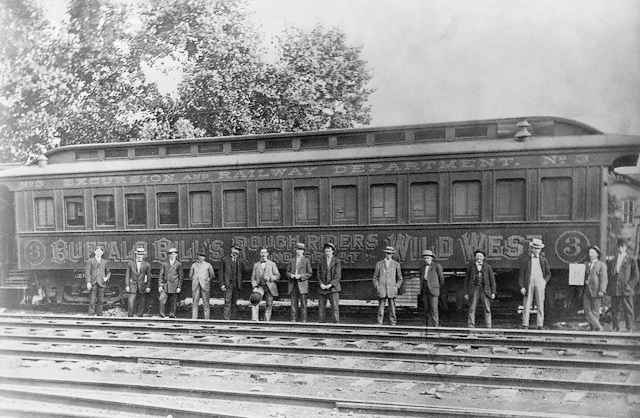 Eager employees of Bill Cody stand before their rolling office. The hard part of the car was adapting John's art into a usable decal. While I use an Alps printer for most of my decals, it just doesn't do very well with colors which morph into other colors as are on the lettering. If I used an inkjet, the decal would not be opaque enough and the car color would show through greatly changing the appearing. Some of the decal would disappear altogether. To solve this, I printing a white decal on the Alps and applied it to the car. This provided my opaque undercoat. The colored part of the decal was then printed on inkjet decal paper. Aligning the color decal with the already-applied white one was a little tricky but I think the result was worth it. With this done, I am enthusiastic about building new versions of cars 1 and 2. I have new and better artwork for them as well, thanks to John. You should take a look at his website when you get time. He's done some interesting things building cars and structures. A Beginning . . . The Sierra Nevada Mountains can be seen from the line of the Stockton & Ione. In August, most of the grass on the foothills is dead with some contrasting bushes and trees. Many of you may have noticed that the Stockton & Copperopolis has had no backdrop other than a painted sky. The main reason for this is that I have been wary of trying to do any painting of hills, trees, etc. In school, art class never really interested me and I have had little in the way artistic training. A few years ago, though, I attended a clinic put on by Dave Biondi of California. He is an excellent artist and gives good explanations of what he is doing and why. We had the opportunity to talk for a while and I eventually purchased a DVD showing how he paints California type foothills. After reviewing this DVD, I finally felt somewhat confident in trying my own hand. If things went wrong, I had plenty of "sky" paint to correct the mistake. The Amador Coal Company mine will be located in Ione. 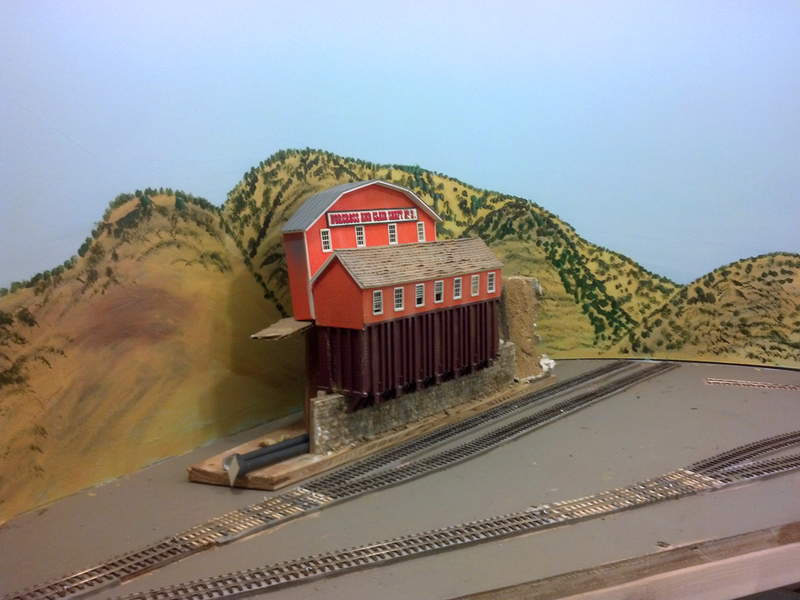 Hillside scenery will be added to the left and right sides of the mine building and blended in with the backdrop. Today, I painted part of the backdrop along the Stockton & Ione line. There were no structures as yet so the painting would be easier. Here are the results. I still don't consider myself an artist but at least I feel I can do some justice to the backdrops of the layout. purposed into the Amador Coal Company's headquarters. Over the last few weeks, I have also managed to install lighting and valence along the S&I. It's starting to look like a railroad! Next comes the backdrop behind Ione City at the end of the line. By the way, if anyone is interested in the Dave Biondi DVD, it is entitled Painting California Foothills and Forests and is a two-DVD set. It is available from Daryl Huffman's website.